LOS ANGELES -- It's not "American Idol." And it ain't "America's Got Talent." But it's a search, nonetheless. One that will go far and wide looking for the next bench superstar. Killer vocals are not required. Ditto with dancing skills, circus tricks and other gimmicks. Ventroloquists need not apply. Experience, not necessarily age, is a plus. But the ability to manage extra large egos and deal with Xs and Os are indispensible. The vacant job is arguably one of America's best. It's high-profile, prestigious and quite simply, just cool. The job also pays generously well considering that it's previous occupant took home $24 million in his last two years at play, oh I mean, work. And as a bonus, he also dated the team owner's daughter. Welcome to the search for LA's next Lakers Head Coach. 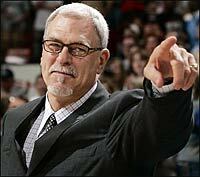 Who will inherit the throne once occupied by legends such as John Kundla, Bill Sharman, Pat Riley, and most recently Phil Jackson? Whose feet can possibly fill in those bejeweled purple-and-gold shoes and live up to both its size and expectations? Just days after Jackson the Zen Master declared he was done -- for now, anyway -- the Lakers are anxious for a replacement as they chart a course into the future. Conventional wisdom dictates that Brian Shaw should get the job. Kobe Bryant and Lakers fans voting in a Los Angeles Times online site endorsed Shaw believing he has "familiarity" with LA's personnel and coaching strategy. Shaw, after all, has been a Lakers assistant coach since 2004. He can diagram the Triangle offfense in his sleep. Shaw, 45, played in the NBA for 14 seasons, amassing 6,547 points, 3,183 rebounds and 3,918 assists. He has three championship rings and commands the respect of both his peers and his players. But the Dallas Mavericks mangled the Triangle and easily eliminated the Lakers in these ongoing 2011 playoffs. The word "bloodbath" couldn't even come close to depicting the enormity of that 4-0 sweep at the hands of Dirk Nowitzki and friends. That being said, the Lakers' management is obviously unsure if the Triangle is still an option moving forward. And that's why Shaw still has the "assistant" tag on his title. Friday afternoon in Los Angeles, the Lakers announced that Shaw will indeed interview for the head coaching position. So will another ex-NBA player, Chuck Person, currently an assistant coach with the Sacramento Kings. The Lakers are also said to be "very interested" in Rick Adelman, an accomplished coach who took the Portland TrailBlazers to the NBA Finals in 1990 and 1992. He has coached four different NBA teams, piled 860 wins, and whose contract was not renewed by the Housotn Rockets at the end of the 2010-11 regular season. Adelman, 64, is best remembered as the head coach of the Sacramento Kings (1999-2006), who then paraded Chris Webber, Mike Bibby, Vlade Divac, Doug Christie, Peja Stojakovic, et al. Also in the Lakers sights is 49-year old Jeff Van Gundy, a former Knicks and Rockets head coach. Van Gundy, his wit, humor and expansinve knowledge of the game are all currently in display at ABC-ESPN, where he does color commentary for NBA broadcasts. Four names. One dream job.